Written by: Mustansar Hussain Tasir on November 15, 2018. 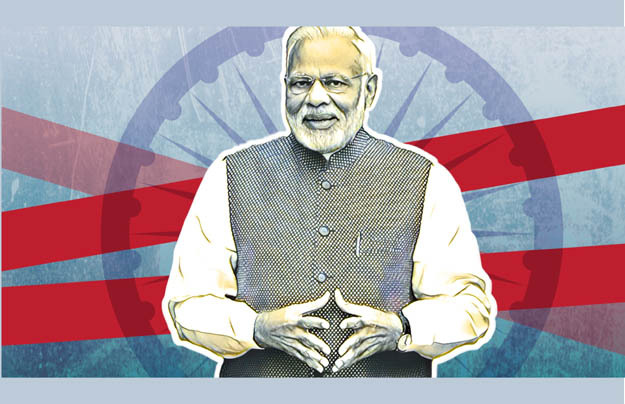 Only the bigoted would deny that Indian Prime Minister Narendra Modi has very cleverly impregnated his country’s foreign policy with an unprecedented dynamism and assertiveness. Earlier this year, a study conducted by China Institute of International Studies (CIIS), a think tank affiliated with the Chinese foreign ministry, also affirmed this assertion. The CIIS called ‘Modi Doctrine’ a distinctive and unique strategy for the rise of India as a great power in the new configuration of things and said that India’s foreign policy has been boosted by Modi government’s risk-taking ability. India’s initiative and risk-taking prowess under ‘Modi Doctrine’ manifested clearly in Russian president Vladimir Putin’s recent two-day visit to India. The summit culminated in inking of 8 agreements and MoUs. The most significant, however, was the deal to purchase Russian S-400 Triumf air defence missiles. Another similar instance is that despite severe US-imposed sanctions on Iran coming into force on November 04, India is going to buy 9 million barrels of Iranian oil in the same month. The principal ‘risk’ involved in this $5.4 billion deal – one of the biggest defence deals between the two countries was inviting the wrath of the US – India’s strategic partner – in the form of sanctions that could be imposed on India through ‘Countering America’s Adversaries Through Sanctions Act (CAATSA)’ as was done recently with China due to a similar defence purchase agreement with Russia. India’s initiative was a depiction of its perceived weight and relevance on the world stage and its successful diplomatic maneouvrability to sell itself as a counterbalancing power against China. While, at the same time, it is enjoying voluminous trade ties with China as well. Perceiving a divergence between India and Russia, Pakistan was expecting that the current regional and global resetting will offer it an opportunity to get closer with the latter. It was also because India has been putting all its eggs in the US basket, especially against China – Russia’s closest ally – on many an issue including the South China Sea, Tibet and OBOR initiative. Also, India has, of late, been knocking the doors of the West, the US and Israel for defence and security cooperation, curbing its military hardware imports from Russia. While India-USA-Israel strategic partnership and cooperation in the fields of nuclear energy, defence, cybersecurity, counter-terrorism and others, have soared to new heights during the Modi era, the recent Indo-Russian re-engagement seems to have dashed many of Pakistan’s expectations. Well prioritized, India has placed special focus on its neighbours. Surprisingly, Modi chose Bhutan for his maiden foreign trip. With exception to Pakistan, it would be no exaggeration to say that India has bridged gaps with almost all SAARC nations, and has established its image as a peacemaker and problem-solver state. India has also gained authority over the rest as a leading Indo-Pacific power and a regional hegemon so much so that some SAARC member states, e.g. Afghanistan and Bangladesh, have categorically expressed their unwillingness to work with Pakistan. Then, India’s ‘Act East Policy’ (AEP), launched at the East Asia Summit in Myanmar in November 2014, has injected great vigour to the pursuit of Indian foreign policy goals in the ASEAN region. The engagement and cooperation are multi-faceted. The AEP has, indubitably, yielded tremendous benefits. Only on the economic front, till the year 2017, India’s trade with ASEAN rose to more than 10 percent. The country’s current trade volume with the region is US$ 81.33 billion which is around 10.6 percent of its total trade. And, it is expected to touch US$ 100 billion by 2020. Pakistan, on the other hand, is lagging far behind – even at less than India’s half. Moreover, India’s major focus nowadays, is on Europe. The European Union today is India’s largest trading partner, accounting for 13.2 percent of India’s overall trade. Their trade volume of goods in 2017 reached €85.8 billion. France, the United Kingdom, Germany, Spain, the Netherlands and Portugal are some countries of which Modi has won great trust. Similarly, the astounding pace at which India has gained its foothold in the Middle East and Africa is also no secret. India is developing Iran’s Chabahar port and constructing massive infrastructure in the country, while at the same time, it is strengthening economic, energy, security ties with Iran’s archrival Arab countries. Another instance is its serious economic engagement in Africa from the platform of BRICS. Modi is also successfully pursuing ‘Connect Central Asia’ policy directly by putting India’s ‘soft power’ to work, and through the SCO. These are some of the significant successes of Modi Doctrine that need to be studied by the new government in Pakistan especially because Central Asia and Africa, despite their providential prospects, have not been on the foreign policy radar of Pakistan. A person who once was called ‘the Butcher of Gujarat’ and was banned from entering the United States and many European countries is now the third most favourite global leader (as assessed by Gallup International Association (GIA) and CVoter International collaborative survey). It is indeed an extraordinary transformation. Despite extreme spike in its grave human rights violations in Kashmir (recently documented by a United Nations report), its intransigence on the issue of talks with Pakistan, its massive military modernization that has jeopardized regional stability, and many other acts of aggression, India, under Narendra Modi, has effectively established its image as a civilized, peace-loving and responsible state. Only a few months back, in June 2018, the Office of the United Nations High Commissioner for Human Rights (OHCHR) published its first-ever report on the human rights situation in Kashmir wherein it reported that gross human rights violations by Indian forces in Kashmir have worsened unprecedentedly during the Modi rule. But, a big majority of the UN member states kept a culpable mum over the issue and avoided any condemnations despite their commitment to the UN Charter and its Human Rights obligations. Astonishingly, in October, India got elected to the OHCHR securing 188 votes in the Asia-Pacific category after the UN’s 193-member General Assembly voted to elect new members into the top human rights body. Such are the contradictions and double standards of the world community. Factually, these are very significant milestones achieved by India in the domain of foreign policy. Pakistan has a lot to learn from India, especially from its foreign policy accomplishments. Successes of Modi Doctrine in widening and deepening of India’s engagements in the region and beyond prove the fact that hurdles can be turned into opportunities to achieve your cherished dreams through the right setting of national priorities, broadening of vision and persistence of efforts. Apart from hostility with India, Pakistan’s new government needs to learn that in the realist international system, only those states win concessions and waivers for the attainment of their economic growth which successfully create converging spaces and more interdependence with other nations. So, achieving this for Pakistan is possible but for that all institutions must be in line with the state’s prized national interests. Only then some well-thought-out policies based on the true national power and potential can lead a nation to the heights of affluence and prosperity. This post has been seen 14143 times.